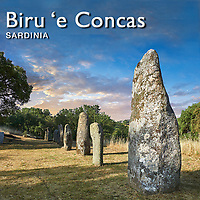 Pictures and images of the prehistoric menhir standing stones of Biru ‘e Concas, Sorgono, Sardinia. The Biru ‘e Concas archaeological site contains one of the Mediterranean largest collection of menhir standing stones. There are about 200 menhir standing stones at Biru ‘e Concas dating back to the period between the Late Neolithic (3300-2700 BC) and the Eneolithic (2700-1700) . The stone monoliths are spread out over Biru ‘e Concas as single stones and in lines and circles. Most of the stones are porto-anthropomorphic having been chosen and shaped to represent the human form. Some of the stones are anthropomorphic having been finely shaped into statue Menhirs with traces of daggers sculpted on them. Biru ‘e Concas seems to have been a place where rituals were carried out. Archaeologists have discovered residential and tomb structures of the same period and a corridor-like nuraghe with a tholos covering chamber at the site. Speculation that the standing stone Menhirs at Biru ‘e Concas represented the ancestors or great warriors have been put forward but its true purpose will never be known. 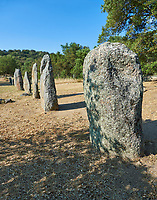 Download pictures and images of the menhir standing stones of Biru ‘e Concas as stock photos or buy as photo wall art on line.